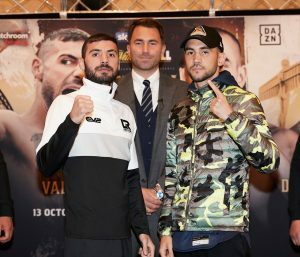 The Newcastle fans were left stunned in the Metro Arena as local favourite and the bookmakers odds on favourite, Lewis Ritson (17-1, 11KO’s) lost to Francesco Patera (20-3, 7KO’s) by split decision for the vacant EBU Lightweight title. The general consensus was that Patera had done enough to win however the first scorecard gave the fight to Ritson 116-112, the other two judges had it 116-112 for Patera. 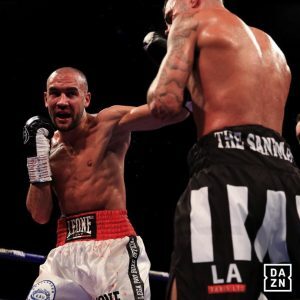 Ritson, who was until last night undefeated, started well, winning the first 3 rounds, working his jab well and pushing forward controlling the fight. Patera, the former European champion, started to come back into it in the 4th round, which could have ended in a draw. The 5th round started with Patera throwing some leather and landed a good body shot that seemed to hurt Ritson, this was the deciding punch as Ritson appeared to slow down somewhat. As the rounds went on it was Patera who was landing the better combinations, showing a good degree of variety throughout the later rounds and had Ritson in some trouble in the 10th. All in all a good fight with Patera a worthy winner on the night, Ritson had started as 66-1 on favourite, which shows how much people valued the former European champ Patera, however Patera put on a skillful show with some lovely boxing to make a mockery of the betting odds. Also on the card was the vacant British and Commonwealth Lightweight belts in a contest between Commonwealth champion, Sunderland’s Glen Foot (23-3) and Liverpool’s Robbie Davies Jr (16-1). This fight started with several close rounds, with both fighters getting tangled up a fair bit. As the fight went on Davies Jr was able to utilise the better boxing skills and range to start to pull away in the contest. The bout went the distance, with Robbie Davies Jr the new British and Commonwealth Champion winning 119-109, 118-110, 117-112. The undercard had several first round knock outs with Joshua Buatsi (7-0) looking impressive retaining the WBA International Light Heavyweight title with a KO of Tony Averlant (26-10-2) in the first round. Scotsman John Docherty, made his debut and won within 10 seconds of the fight starting beating Jordan Latimer, who appeared to ask his corner to throw the towel in. Franceso Patera v Lewis Ritson – Petera wins Split Decision 112-116, 116-112, 116-112. Glenn Foot v Robbie Davies Jr – Davies Jr wins UD 119-109, 118-110, 117-112. Joshua Buatsi v Tony Averlant – Buatsi wins by KO RD1. David Allen v Samir Nebo – Allen wins by KO RD1. Simon Vallily v Craig Glover – Glover wins by TKO RD8. Anthony Fowler v Gabor Gorbics – Fowler wins by TKO RD5. Thomas Patrick Ward v Tom Tran – Ward wins by TKO RD1. Lawrence Osueke v Charles Adamu – Osueke wins by decision. Hosea Burton v Saidou Sall – Burton wins by TKO RD1. Joe Laws v Chris Truman – Laws wins by TKO RD4. John Docherty v Jordan Latimer – Docherty wins by TKO RD1. Darren Reay v Samuil Dimitrov – Reay wins by TKO RD1. Chad Ellis v Angel Emilov – Ellis wins by decision. Terry Wilkinson v Chris Adaway – Wilkinson wins by decision.